Gift cards make great gifts. They put the consumer in control of what they want to buy from your store instead of receiving something they might like. They provide a solution for the customer who is struggling to find a gift for the person “who has everything” or is “impossible to shop for”. It also provides customers with a turnkey gift-giving solution that is fast and convenient. Although, as USA Today points out, “retailers can’t count gift card sales as income until they are redeemed,” there are some benefits to the savvy business owner to selling gift cards and gift certificates. 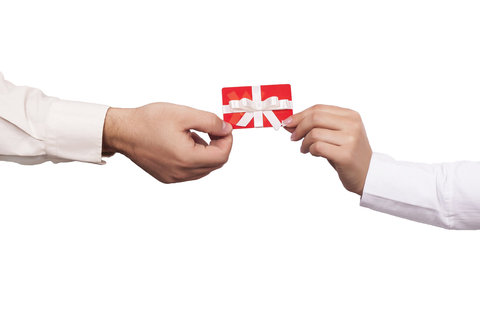 When customers redeem their gift cards, it is a perfect opportunity for your sales team to up-sell. The gift card brought them into the store, but they may be willing to spend some of their own money in addition to the gift card if your sales team can help them find a “must-have” item. In fact, according to Retail Category Consultants, the average gift card redemption generates on average 4.5 times the gift card’s original value. Beyond driving consumers into your business with the potential up-sell, there is also a value to using them for promotional purposes. Yes, similar to couponing you are in essence giving away money, but gift cards feel more like money in the hands of customers. And remember, shoppers who do redeem their gift card are likely to spend 4.5 times the gift card’s original value, resulting in profit for your business. Alternatively, those who don’t redeem the gift card may have an improved opinion of your business (because who doesn’t like being offered free stuff), resulting in a ‘win-win’ situation. Let’s look at some ways using gift cards in a promotional capacity can benefit your business. A gift card can bring new customers into your store. Maybe they’ve heard of your business and have been meaning to check it out, but the gift card you sent gave them a reason to make their first visit. Another tactic is to give two gift cards: one for your existing customer when they bring in a friend, who will receive the same discount when she makes her first purchase with your store. Promotions like these are a great way to leverage your current customer base to bring new customers into your store. Giving your current customers gift cards can assist in repeat business and increase the frequency of the visits your customers make to your store. This will increase their sentiment of your business and drive them into your store. The gift card may have brought them in, but their store experience helps you retain their business and up-sell your customers as well. Maybe they come in to buy a cute dress, but they can’t leave without the perfect shoes and purse to match. Partnering with a philanthropy or a complementary business for promotions is a great way to leverage your partnerships to broaden your business’ reach and brand awareness. Many charities are looking for monetary and product donations, but some also do “gift card walls”. Each type of donation offers different levels of exposure, but all offer exposure to a new audience that may not be familiar with your business. The right strategic partnership with a charity may result in new and returning customers, amplified brand awareness, increased sentiment of your business, and an opportunity for a press release on your cause-related marketing.